As a Michigan homeowner, you may be in the process of improving your home’s lighting. From sconces and track lighting to dazzling chandeliers, you have a wide range of modern lighting options to choose from. Oftentimes, people are intimidated by the sheer number of styles and designs available. Even if you find a lighting fixture you love, it can be challenging to install it in a place that’s visually pleasing. For those shopping for quality outdoor and indoor lighting in Jenison, The Lighting Corner is here to help! Since 1984, our expansive lighting showroom and knowledgeable staff have worked to deliver the best results for our Michigan customers. We know that you have your own unique style, and we strive to deliver the best products to enhance your life! For those looking for quality solutions for their home, pendant lighting can prove to be a dynamic and versatile choice to illuminate their space with quality. These hanging light fixtures have a lot of potential for revolutionizing your home, but only when they are placed correctly. Today, we’ll begin to discuss a few pendant lighting tips to help you plan for your home lighting project. When done, be sure to stop by our Jenison lighting showroom to find your home’s new look! Placing a hanging light fixture in your hallway can help to create a dynamic and dramatic outcome for travelers through this space. It’s important to space out your pendant lighting as to provide an equal level of illumination throughout the entire length of the hallway. Homeowners who place their pendants too close to the ceiling will notice immediate problems in light coverage. If you have high ceilings, be sure to find pendants that are long enough to be in your line of sight while you are in the space. If your ceilings are too low for hanging lights, we recommend flush-mount options. The spacing for your hallway will vary, but be sure to space each fixture out evenly for a uniform look. It’s important to provide enough lighting to overlap and avoid dark spots in the hall, but be mindful of crowding your ceiling! Every hallway is different, making it important to adapt your dimensions to create uniformity. It will take some work to find the perfect balance, but our home lighting experts can help! Properly lighting your home will help to illuminate it in quality and transform the aesthetic benefits of each and every room. Next time, we’ll continue to discuss areas in the home that can benefit from pendant lighting. 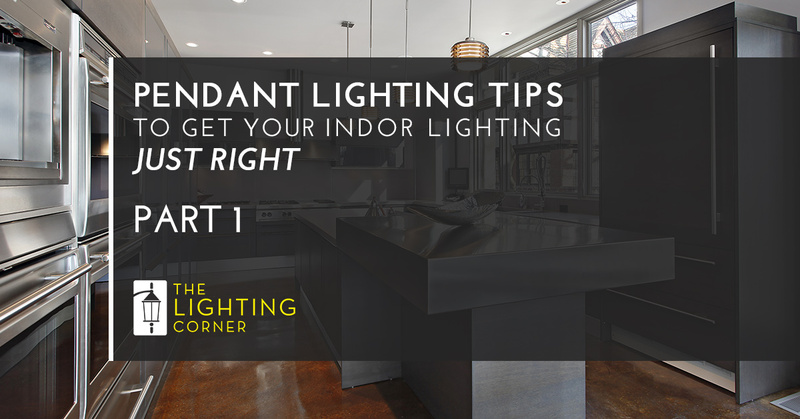 It can be a daunting challenge to find the perfect indoor lighting for your Jenison home, but our experts can help! The Lighting Corner is proud to be your go-to lighting store in Michigan, providing expert advice and quality products to everyone that steps through our door. Contact us for assistance or stop by our lighting showroom to begin planning your project!